Complete our Thesis Order Form 1-2 days before or on the morning you plan on getting your thesis bound. Please ensure that all information you fill out on the form is spelt correctly as we use this information to make your covers in advance. Once printed you will receive a text message with a time for collection and the total cost. Pick up your bound copies from our workshop, we are open Monday - Friday 7am - 4pm. Or call us and we can arrange delivery or Saturday collection. The page numbers are a guide to let us know how thick to make your cover. If we are printing your thesis for you we use a high-quality 120gsm white paper. Every page of every copy is printed, not photocopied, thus guaranteeing the highest quality no matter how many copies you require. We can print your thesis double-sided, if you require this service then put the full amount of pages on the order form and Select double-sided printing. There is an additional information section on our form, in which you may tell us if you would like the university name, school or department etc. placed on the cover or any other requirements from your University regarding the layout. You can also use this section if you require any of the words on your title to be in Italics. Please put the exact words required in the additional information section. We offer three styles of thesis binding. Your thesis will be Gumbound with a leatherette cover with gold embossing on front cover only. Your thesis will be thermal bound with a clear cover at the front and black card at the back. Your thesis will be spiral bound using a plastic comb with a clear cover at the front and black card at the back. 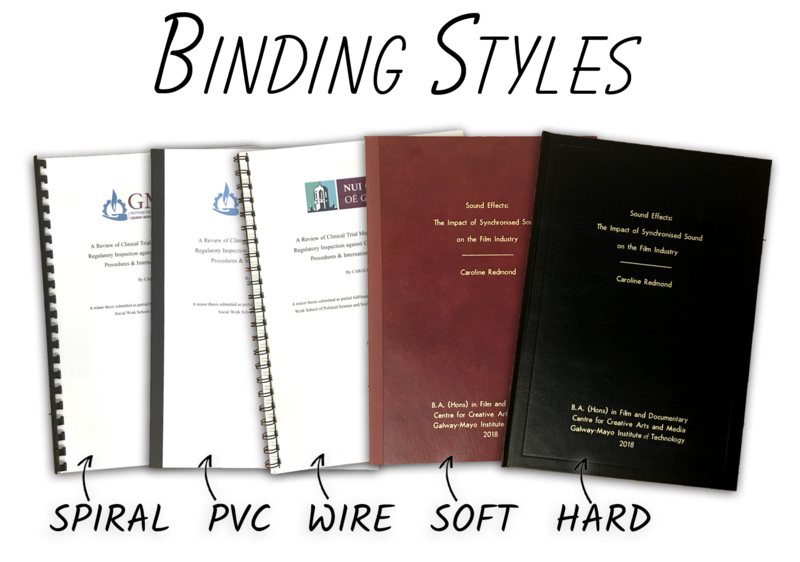 Your thesis will be wire bound using a black metal wire with a clear cover at the front and black card at the back. "How to Prepare your thesis for binding"
"3 Tips - How to Save Money on Thesis Binding"
"5 Tips : Formatting your Thesis"